The recreation ground Community Landing Site is now operational thanks to generous local support. 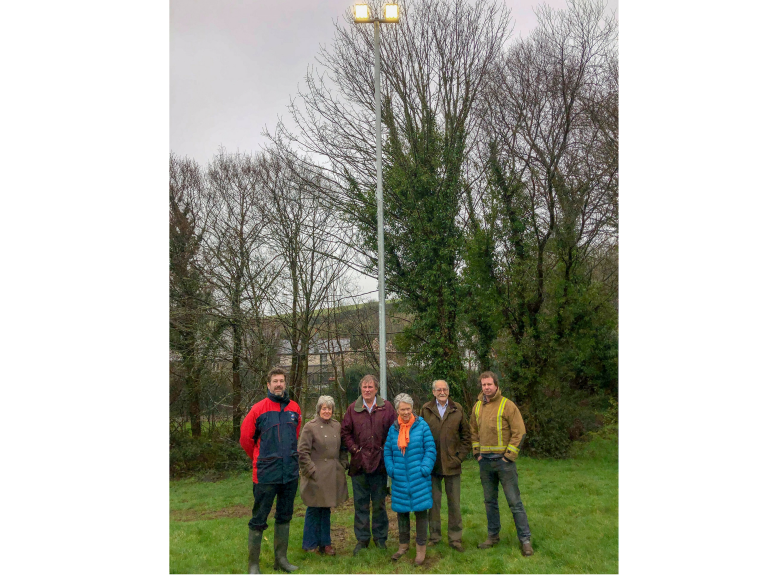 South Tawton Parish Council is delighted to announce that the Night Landing Site at South Zeal Recreation Ground is now operational. The facility allows the Air Ambulance to land during the ‘hours of darkness’, which is of vital importance for such a rural parish. The Parish Council would like to thank Devon Air Ambulance for all the help and support during the process, also acknowledging the landowners, South Zeal Recreation Ground Association, for their continued support and willingness to work with the Parish Council, which has been crucial to the project’s success. The Parish Council received grants from Devon Air Ambulance (from the Bank LIBOR fines), Councillor James McInnes’ Devon County Council Locality Budget, West Devon Borough Council’s TAP fund (now the Communities Together fund), the Chagford Show Fund and donations from David Jeffery (who raised money with his annual Christmas lights). Also, a donation from, and now in memory of, June Alcock, mother of local resident Shirley Denford. Such generous grant givers and donors are vital to allow this kind of project to proceed and the Parish Council is very grateful for the generosity. “We are extremely grateful to all those who helped to develop and fund the Community Landing Site at South Zeal recreation ground, which now means we can reach patients in the area until 2am every day. 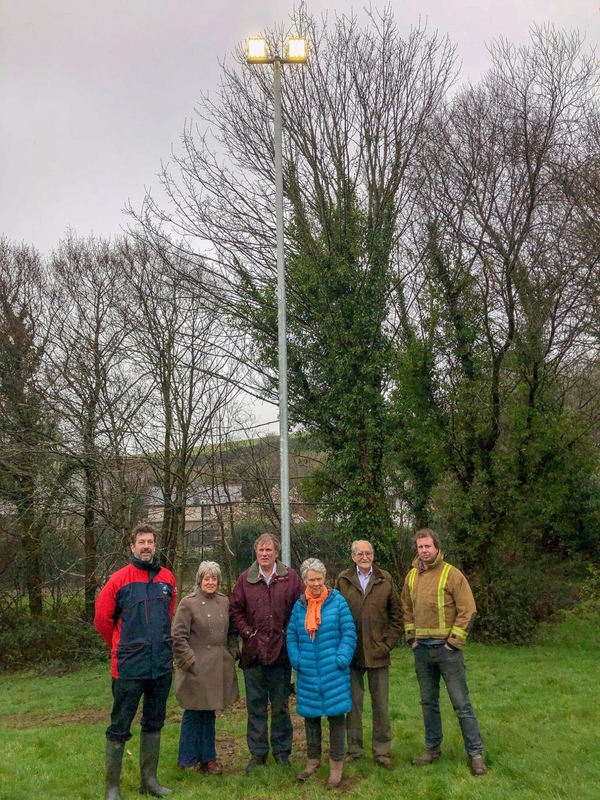 Our thanks to South Tawton Parish Council, South Zeal Recreation Ground Association and the numerous local people and organisations who made this night landing site become a reality”. Photo shows, L-R; Toby Russell, Devon Air Ambulance; Linda Sampson, South Zeal Recreation Ground Committee; Andrew Sampson, Chairman of South Tawton Parish Council; Jane Warren, neighbour; Ray Souness, South Zeal Recreation Ground Committee; Councillor Paul Warne, South Tawton Parish Council and South Zeal Recreation Ground Committee. Devon Air Ambulance Trust is the Charity which raises the funds to keep Devon’s two Air Ambulances flying. The service is 27 years old and is funded by the generosity of the community, businesses and friends of Devon. Last year it cost £7.5 million to keep the service flying, helping 1109 patients, of which 11% were children. The Exeter based aircraft operates until 2am every day and since it started flying into the hours of darkness over 118 patients have been helped at night time, using our growing network of Community Landing Sites. You can read more about our community landing sites here. Why not check out this Charities business in Exeter. Devon Air Ambulance is a 'thebestof' business member.